In the comics, Thanos is unquestionably one of the most formidable presences in the Marvel universe… but the same can’t really yet be said about his live-action counterpart. Sure, the giant purple alien has done a good amount of orchestrating behind the scenes and made serious threats, but audiences haven’t actually seen him do much more than sit in his giant throne and smile. 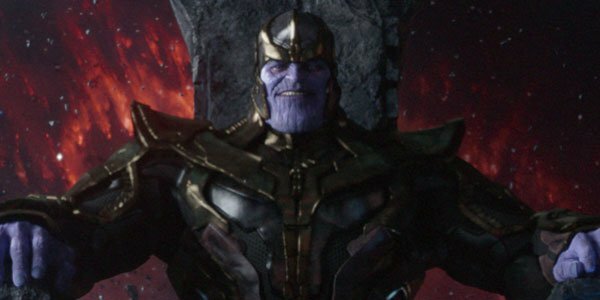 Given the Marvel Cinematic Universe’s less-than-brilliant track record when it comes to villains, this has left some fans a touch concerned – but it’s an issue that the Avengers: Infinity War screenwriters are tackling full-on, by giving the character all of the proper screen time and perspective that he needs to make audiences wet themselves. Stephen McFeely: I think the problem will be solved simply because he will be the villain, have lots of scenes, and you’ll understand his point of view. He’ll do lots of dastardly things. I’m not saying he’s not a challenge. He is, because he’s got so much power, but I guess find the, I’m using this in quotes, ‘the human underneath,’ but we’ll have the opportunity because he’ll have a lot of scenes. Christopher Markus: Yeah, and like any character, we’re going to learn about the character, not just as a villain. If you’ve got the guy taking you through more or less two movies, he can’t just be twisting his mustache the whole time. The Avengers: Infinity War writers couldn’t get much more detailed than that, but it certainly does raise the important question: how do you manage the motivations for an alien tyrant who wishes to achieve god-like power and rule over the universe? In the comics, the answer to this question is simple: love. Thanos has a deep, deep passion for the physical manifestation of Death, and basically wants to collect all of the Infinity Gems and the Infinity Gauntlet just to impress her. At this time it’s unclear if we can expect an adaptation of this relationship in Marvel Studios’ two-part blockbuster, but it has been rumored that Cate Blanchett will be playing Hela, the Asgardian goddess of death, in Thor: Ragnarok, and one could imagine her being the target of affection from Thanos (played by Josh Brolin). There’s still a long road ahead for The Avengers: Infinity War, as Christopher Markus and Stephen McFeely told me that they just turned in their second draft this month – with surely many more drafts to come just because of the way the upcoming Marvel movies will change things in the Marvel Cinematic Universe. As always, we will keep you up to date with all of the latest news, and be sure to check back for more from my interview with the Captain America: Civil War writers!